Council of Europe, , 148 p.
At the height of the Second World War, Switzerland decriminalised homosexuality. At the same time, France chose to introduce a law punishing homosexual relationships in certain circumstances. These two examples illustrate contradictory attitudes adopted by European states towards homosexuals during the Second World War. Going beyond the issue of the persecution of homosexuals and the central role played by Nazi Germany between 1939 and 1945, this book is the first to examine the daily lives of homosexual men and women in wartime. By bringing together European specialists on the subject, it relates a different history, one which was indeed marked by repression but also by enlistment in armies at war and resistance groups, not to mention collaboration. 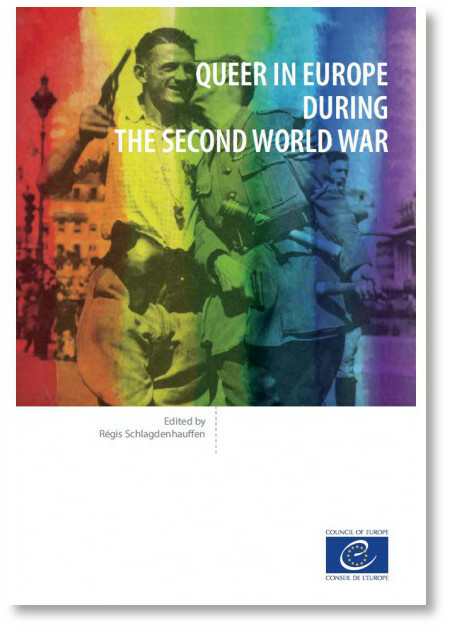 Chapter by chapter, it enables us to better understand why the Second World War was a turning point for gays and lesbians in Europe and why our continent is a leader in the fight against discrimination. For the Council of Europe, this book contributes to two separate programmes, the Passing on the Remembrance of the Holocaust and Prevention of Crimes against Humanity programme and the Promoting Human Rights and Equality for LGBT People programme, within the framework of Committee of Ministers Recommendation CM/Rec(2010)5 on combating discrimination on grounds of sexual orientation or gender identity programme. It also continues work towards acknowledging all of the victims of the Nazi regime. Régis Schlagdenhauffen is a lecturer at the École des hautes études en sciences sociales (EHESS), head of the gender-based social history department, member of the Laboratory of Excellence “Writing a new history of Europe” (LabEx EHNE) and co-author of the Council of Europe pedagogical factsheets for teachers entitled “Victims of Nazism. A mosaic of fates” (2015).